Thanks for taking a moment to read my first post! Over the summer, and hopefully beyond, I will be using this blog to share about myself, my adventures, and the things about which I am passionate. I am a born and raised Californian who loves Jesus, people, architecture, and delicious chilaquiles (yes, like Propaganda says, they'll definitely be served in heaven). I currently attend Cal Poly SLO as an Architectural Engineering (ARCE) student. San Luis Obispo, California is a wonderful place to live, and when I graduate in December I will be sad to leave it. It's full of gorgeous hikes, terrific people, and is the birthplace of tri-tip. Me and my sandboard out at Montanña de Oro on the dunes. PC Taylor K.
This summer I will be spending my time traveling, working, and exploring new places. I am both excited and a bit anxious as I will be gone for nearly 3 months - much longer than I have ever been away from US soil. Most of my time will be spent in New Zealand, working at the University of Auckland in the Civil Engineering Department. Two other Cal Poly ARCE students and I have been assigned to separate research teams within the Civil Dept. The project I will be working on focuses on testing reinforced concrete in seismic events (more on this in later posts). For 8 weeks, the three of us will be living in the heart of Auckland's CBD and enjoying the kiwi lifestyle. I am hoping to take weekend trips to explore both the North and South Island. While I hope to spend time tramping, when possible, I am extremely excited to be conducting research related to seismic events. Having grown up in California, earthquakes are always on my mind. One of the reasons I am so excited about structural engineering is that it involves understanding how earthquakes impact buildings and how we design buildings to keep people alive. After New Zealand, I'll be headed to Nepal with a stop or two in Southeast Asia along the way. In Nepal, I will be meeting up with more Cal Poly people and Miyamoto International, a non-profit engineering firm focused on disaster relief. We will be teaming up to design the rehabilitation and retrofit scheme for the gateway arch next to the Gaddi Baithak in Kathmandu. This project strikes right at the heart of where I hope my career will take me. I want to help others, design structures to be safe, and meet people and hear their stories. There isn't much more to add for now, as I am currently on US soil. I am looking forward to my entire summer and I hope you'll keep up with me via this blog and other social media. 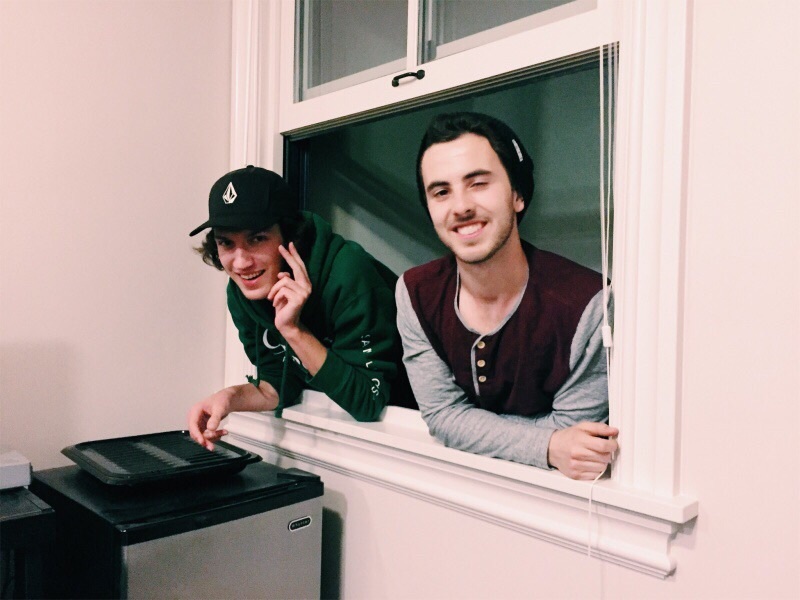 Here's a goofy one of me (left) and Jack just hanging out my apartment window last year. PC: Taylor K.